For non-Canadians, Marcelle is a Canadian cosmetic brand that has been around for a very, very long time. Marcelle and Annabelle are the mass market cosmetic lines owned by Québec-based Groupe Marcelle, and they are practically ubiquitous in Canadian drugstores. Groupe Marcelle, also very recently acquired Lise Watier, a luxury Canadian cosmetic brand, to add to their drugstore lineup. While Annabelle is better known for makeup (I even remember their squat little oval nail polish bottles from the ’90s, though sadly, I never purchased any), Marcelle is probably best known for skincare and the product I’m reviewing today: their Translucent Face Powder, which has been around for ages. Marcelle as a brand never appealed much to me—probably because they don’t sell nail polish, ha! Jokes aside, their face products always seemed a little too pink-toned for my warm-toned skin, and while their popular eye makeup remover works well and is well-priced, I’d rather pony up a little bit more for something better. Their makeup packaging is also decidedly ho-hum and a bit lost in the ’90s, and reminiscent of Almay’s stodgier sister. 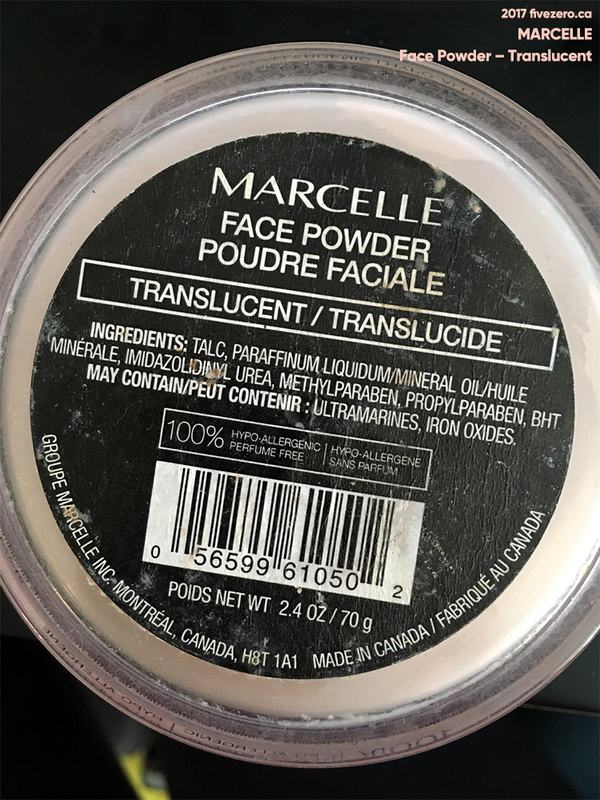 However, at the end of 2014, I was in the market for a new loose face powder and I picked up Marcelle’s Face Powder in Translucent. It was a total whim, since I didn’t even wait for it to go on sale. Of course, I paid CA$14.99 at Shoppers Drug Mart, and then it went on sale the week after. I can’t say it wasn’t worth full price, though. The tub is gargantuan. It holds 2.4 oz / 70 g. Do you know how much loose face powder that is?! Then, this morning, I went and scoped out a couple others in-store (Joe Fresh, Quo, and Iman). Yes, I got carried away. But hey, look how economical Laura Mercier seems! And holy crap, L.A. Girl. Back to the Marcelle powder! Despite its very, very low cost, it remains a perfectly good and serviceable finishing powder. It is finely milled and has a silky feel. My skin is naturally dry, though it does get a bit oily throughout a hot day. This powder does well to keep my foundation looking even and not oily. This loose powder is the perfect tool for setting your makeup or for making those little touch-ups during the day. Its texture ensures beautifully matte skin while micronized talc absorbs excess oil for extra-long-wearing comfort, giving you a perfectly evened-out skin tone. Its soft powdery texture leaves your skin feeling silky smooth. Apply directly over skin for a natural look or over your foundation for long-lasting makeup. It actually comes in two shades: Translucent and Translucent Medium. Mine is the plain Translucent. Translucent isn’t actually very translucent, though. It definitely has a bit of color to it, which is noticeable on the face. Unfortunately for me, it’s a pinkish-beige tint, so I prefer using this over too-yellow foundations to neutralize them a bit more. If you’re not keen on talc and/or parabens, or a pinkish tint, this powder isn’t for you. Otherwise, I feel it’s a really good powder for the price. It is also perfume-free, which is a nice bonus for many. I’d say I’m probably not going to repurchase it due to the pinkness, but I really have no idea how long this tub is going to last me. I use it almost every day, it’s been two years, and it’s showing no signs of emptying. 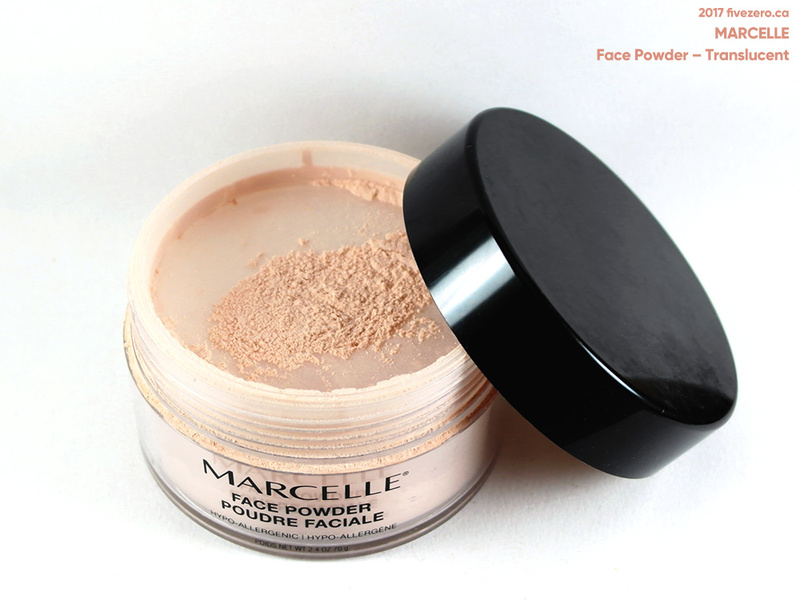 Marcelle Loose Powder in Translucent contains 2.4 oz / 70 g and retails for CA$14.99–15.95. The company is cruelty-free. 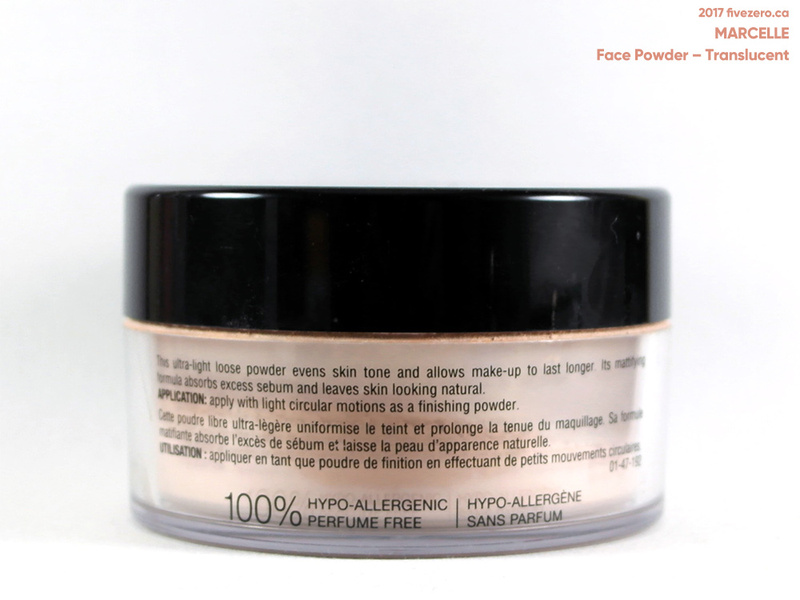 Most of Marcelle’s products are also vegan, including this powder. Marcelle personal products were introduced in 1874 by Chicago, USA-based C.W. Beggs Sons & Co. Their Face Powder was first sold in 1919. In 1933, Dr. Phil Blazer purchased the brand, entered Marcelle into the Canadian market in 1949, and sold the brand to Borden Co. in 1957. Finally, in 1973, the brand was sold to Professional Pharmaceutical Corp. in Montréal, Canada, where Groupe Marcelle remains headquartered today. I love a good face powder so I’ll definitely have to give this one a try. Thanks for sharing! I’m looking forward to your future posts. 70 grams?!! I’ve never come across any powder this large unless it’s for theatrical use in which they are putting it on the body as well as using it on many performers. OMG, your chart is making me swoon… ❤ 85 row table? So deceptive that LA Girl and Laura Mercier are the same per oz price! I shall get the Laura Mercier pronto! I know, the LA Girl is so $$$. I’m thinking MAC, Bourjois, Clinique, LM, and even Chanel are looking reasonable! I have my eye on that EA one with ceramide.